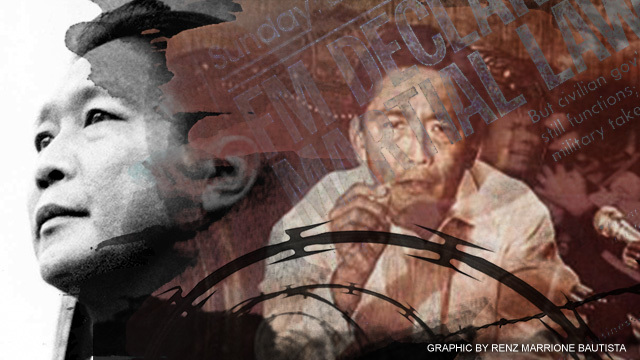 Forty-two years ago, Ferdinand Marcos issued Proclamation No. 1081 declaring martial law and proceeded to rule the country without accountability− not even to the Constitution that he had sworn to serve. Today, we remember September 21 not as a “National Thanksgiving Day” but a sad episode in our nation’s history. Martial law stumbled into our midst like a thief in the night. It’s like suddenly waking up the next day with a strange gut feel that something seemed not right. Nevertheless, you squandered around, hoping to confirm your suspicious thoughts. And there, you discover the systematic looting; your precious human rights, stolen, robbed! Contrary to popular belief, it was on the night of September 22, 1972 when Proclamation 1081 had gone full steam. It appears that September 21─the official date of commemoration─ refers to the actual signing of the proclamation and it was only on September 23, 1972 when martial law was made known to the public. Later though, Marcos revealed that he really signed the martial law edict on September 17, 1972. So our story begins on September 23, a Saturday morning when a certain eerie of silence jolted the nation from deep slumber. Everybody woke up without newspapers on their doorsteps. On TV, except in one station where the national anthem was repeatedly played, broadcasting had been stopped. Nothing on TV but ‘snow’ and static on radio. The streets of Metro Manila were said to be virtually uninhabited and abandoned like a lifeless city. Hours passed, still no newspapers. People grew restive as fear and panic began to set in. Something terrible was certainly in the offing, baffled Filipinos must have thought. By nightfall, news started to circulate that FM would address the nation and everybody was told to stay put. At exactly 7:15 p.m. that day, the cat was finally out of the bag as the President appeared on national television saying that he had just declared Martial Law. That day was said to be the beginning of one of the darkest eras in Philippine history. While many people view martial law today as a metaphor for everything that is corrupt, oppressive, and detestable, President Marcos saw things very differently when he issued the proclamation. And for a while, many ordinary Filipinos then, tired of traditional politics and economic instability, also gave Marcos the benefit of the doubt. Obviously, they did not mind exchanging their civil and political freedoms for the material necessities of daily existence like a stable job, regular food on the table, and probably, a secured future for their children. In fact, even in the academe, a great number of intelligentsias did think of Marcos’ theory of revolution as offering the possibilities of correcting the ills of society. Of the qualities that made Ferdinand Marcos who he was, his sense of history appeared to be very prominent in his decision points. He used the lessons of the past to hold on to power longer than any Philippine president to date. But he also viewed history prospectively which explains why he left diaries, speeches and wrote a great deal of books to aid scholars, and probably confound history buffs. As early as 1966, on the day of his first inauguration as President, the lines appear quite clearly drawn for Marcos. Driven by his obsession with national greatness and passion, Marcos had seemingly nothing but deep-seated contempt for the status quo since he occupied the presidency. But it was only in 1971, through his book entitled, “Today’s Revolution: Democracy,” when the handwriting on the wall began to appear more legibly: martial law was imminent. Marcos began with a straightforward diagnosis on the national condition: “Ours tends to be an oligarchic society…the consequence is an oligarchic order or an oligarchic democracy.” A year later, this time on “Notes on the New Society,” (1972) Marcos finally launched his creative vision, one that has no parallel in Philippine history in terms of boldness and conception, he said: “the fundamental task of drastic political reform is to democratize the entire political system.” Although a product of the old system of politics, Marcos saw the need to turn against it and embarked on a journey that would radicalize the social order controlled by the political elite. Sensing the situation had reached a point of crisis, Marcos seized his moment in history and waged a ‘democratic revolution,’ one that was often bruited by martial law ideologues as peaceful, legal and constitutional. It is said that Marcos had planned all along to perpetuate himself in power. One obstacle, however, could have prevented him from doing so − the 1935 Constitution. But Marcos knew his constitution forward and backward, and understood its potential thoroughly. Being a brilliant lawyer, Marcos dared to stretch the limits of the fundamental law, studied the cracks in the constitutional structure and experimented them to the bitter end. That he did, and got away with handily. I have no memories of martial law. I was born exactly the same year when martial law was nominally lifted. And I dare not challenge the facts. They are here to stay. But facts can’t be selective. Neither should we. Martial law years is the martial rule not only with its infamous human rights violation or curtailment of basic freedoms, but it is also about a national vision, a dream which unfortunately was not realized. If at all, every September 21 can be and is also a day to celebrate our gratefulness for the freedoms we enjoy today. Ferdinand E. Marcos the dictator is dead but his “revolutionary ideology” will be remembered long in history by different people in different ways.